With 20 quarters in the books for 26 of the league’s 32 teams, now seems like a good time to take a quick look back at the first five weeks of the year and start seeing which clubs have been enjoying notably good or bad times in those hidden factors that help determine success. Some of the statistics and concepts I’ll mention are mostly random and subject to dramatic regression toward the mean over the course of a larger sample, while others might be harbingers of impending success over the remainder of the season. I’ll try to make that clear as we go along. Let’s start with one of the more beguiling and meaningful measures of success out there: fumble recovery rates! As I’ve mentioned in the past, research has shown that fumble recoveries, on the whole, tend to be mostly random acts. Chase Stuart has a great pair of pieces on the fumble recovery rates for specific types of fumbles here and here. In the comments for that piece, Danny Tuccito of Football Outsiders notes that the truly random fumbles are plays where a quarterback is sacked or loses the ball after running past the line of scrimmage; the defense is extremely likely to recover a fumble by a receiver or a running back, while the offense is more likely to recover all other types of fumbles. That doesn’t mean that a specific offense is more likely to recover certain fumble types than another offense, which is an important distinction. I don’t have every fumble separated out by type yet, nor does the Elias Sports Bureau, who provided this and much of the other data for this piece. So let’s consider these figures with a grain of salt, and I’ll mention specific quirks that might be adulterating our expectations. At the extreme ends of the spectrum, it’s hard to sugarcoat how lucky or unlucky certain teams have been. Let’s start with the Miami Dolphins, who recovered just one fumble of the 12 they forced on defense during the 2011 season. The good news is that the Dolphins have already recovered one fumble on defense this season; the bad news is that they’ve failed to pick up any of the seven other fumbles that their defense has forced, and they’ve lost six of their eight fumbles on offense. Three out of 16 fumbles allows for a whopping 18.8 percent recovery rate, the second lowest in the league. On a side note, while I abandoned that Dolphins premise after they named Ryan Tannehill as their starter, I’m beginning to regret doing so. Their defense has been phenomenal, and with Tannehill-to-Hartline showing signs of life amid the doldrums of the Bills and Jets in the AFC East, I really might have hopped off that bandwagon too soon. They could be 4-1 with even a little bit of luck. The only team worse than the Dolphins would be the Denver Broncos, who have been particularly unlucky on offense. Peyton Manning’s offense has fumbled seven times, and while an average team might recover an average of about four of those fumbles, the Broncos haven’t recovered a single one. That’s just not going to keep happening. Denver’s also only picked up two of the six fumbles forced by their defense, producing a league-low recovery rate of 15.4 percent. If you’re a Broncos fan who still wants to believe that their team is a contender in the AFC West, that figure should augur some hope. It’s extremely unlikely the Broncos will recover only one out of every six fumbles that hit the ground in their games going forward. Meanwhile, the Washington Redskins soldier on as the league’s luckiest team with regard to fumbles, having recovered 11 of the 13 opportunities they’ve had across their season so far. 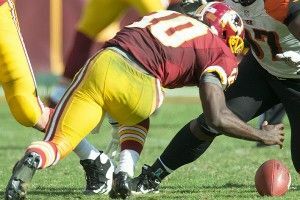 The context of those fumbles has also been enormous: Remember that the Redskins forced a Marques Colston fumble just as the Saints receiver was about to cross the goal line, eventually producing a touchback and a turnover, as well as managing to recover a RG3 fumble in the end zone on offense for a touchdown in Week 4. You may note that the Redskins won those two games by a combined 10 points when thinking about how important fumble recoveries are, even if they’re mostly random. The Redskins have produced a recovery rate of 84.6 percent, while no other team is yet above 72.7 percent this season. The other teams in the top five are the Raiders (72.7 percent), Steelers (71.4 percent), Falcons (70.0 percent), and the Cardinals and Patriots are tied (68.8 percent). All of these are in samples of between 10 and 16 fumbles, so it really doesn’t have much predicative value. The essential Pro-Football-Reference.com tracks strength of schedule for each team using their Simple Rating System, a measure that tries to encapsulate team performance in terms of a point margin by measuring their performance versus that of their opponents (and then their opponents’ opponents, etc). It has the Bears (SRS of 16.2) as the league’s best team, followed by the 49ers (15.7) and Texans (11.0), with the Raiders (-14.8), Titans (-13.5), and Chiefs (-12.4) as the league’s worst. That seems to pass the smell test. You can also use SRS to calculate each team’s strength of schedule over the first few games of the season, which holds some meaning in determining whether some teams have looked better (or worse) than we might think. If you assume that a team with a tough strength of schedule would be underrated, possible candidates for your respect would include the Green Bay Packers (with an average opponent SRS of 6.1) and Dallas Cowboys (5.7). If you’d rather use a simpler metric, note that Green Bay’s gone 2-3 against a schedule of teams that are 11-8 in their non-Packers tilts this season. The Cowboys have faced a group of teams that have otherwise gone 9-6 during their four-game start to the season. By virtue of having to face the Texans, the Jaguars (5.6), Colts (4.6), and Titans (also 4.6) have the most difficult SOSes in the AFC. The easiest schedule in the league through five weeks? Step right up, San Diego Chargers! At an average opponent SRS of -7.7, PFR is suggesting that the average San Diego opponent has had a level of play roughly commensurate to that of last year’s Chiefs. While San Diego did have to go up against the 5-0 Falcons, their other four opponents have a combined non-Chargers record of 3-12. The good news for San Diego is that their schedule doesn’t get much tougher until they enter into a four-game stretch against the Broncos, Ravens, Bengals, and Steelers that starts in Week 11. But this team isn’t anywhere near as good as it might have looked so far this season. Oddly enough, the team with the second-easiest schedule is one that hasn’t looked good, the 1-4 Saints. If that seems unlikely, remember that the Chiefs and Panthers picked up their only win of the year against New Orleans, and Washington is a shaky 1-3 outside of their Week 1 win in Louisiana. Red zone performance is obviously very meaningful, but it’s not incredibly consistent from year to year. Certain teams will have notably good or bad seasons inside the red zone as an offense or defense, but in general, the best way to be a good team in the red zone is to be a good team over the other 80 yards of the field, too. The teams who have been great in the red zone on offense this year are the ones you would probably expect. While Green Bay’s offense has had a disappointing season so far, that doesn’t extend to the red zone, where they’ve been phenomenal, averaging a league-best 5.53 points per red zone possession. Just behind them are the usual suspects: the passing juggernauts of New Orleans (5.49) and New England (5.47), and the efficient attacks of San Francisco (5.41), Minnesota (5.39), and Atlanta (5.33). The only surprise team unmentioned in that group would be the Tampa Bay Buccaneers, who have averaged 5.49 points per red zone possession this year, the second-highest rate in the league. Unfortunately, the Buccaneers have a league-low eight trips to the red zone this year, so they haven’t been able to take much advantage of their efficiency. And, likewise, the teams who haven’t been able to execute in the red zone are the disappointing units you would expect. Cleveland sits at the bottom of the table, having converted on just three of their measly nine trips to the red zone, an average of 3.33 points per trip. Just ahead of them are the struggling offenses of Seattle (3.71) and Kansas City (3.77) and the offensive line injury haven of St. Louis (3.91). Finishing out the bottom five are the league’s most famously disappointing red zone offense and their nemesis; the Eagles and Cardinals have identically produced five field goals and seven touchdowns on 16 red zone trips this season, producing an average of an even 4.0 points per drive. If you’re wondering why the Cardinals have been able to hang on despite that poor performance in the red zone, well, just flip the coin to defense. There, Arizona’s allowed just four touchdowns and six field goals in 14 drives, producing a league-best average of 3.28 points per trip to the red zone. Philadelphia is fourth in that group (3.68 points per drive), partially explaining their ability to stay afloat in difficult situations this season, but this is another spot where Tampa Bay (3.71 points per drive, fifth) looks to be better than people realize. The 49ers have discovered that it’s better to just keep teams outside of your most difficult-to-defend area; they’ve faced just six red zone possessions against them in five games, and while they’ve allowed a league-high 6.33 points per possession on those six possessions, that’s a meaningless sample size. The real worst red zone defense in the league belongs to the Bills and Chargers, who each allow a whopping 5.64 points per red zone trip. With those teams’ respective abilities, that’s a title they should be competing for over most of the season.